DeepSketch is an interesting new application for Apple’s iPad and iPad 2 that can turn these tablets into a digital stereoscopic 3D sketchbook, using the most common anaglyph 3D (red-cyan). DeepSketch has been developed by Mattis Folkestad with the idea to be easy for use and provide spectacular results… that is if you are good with drawing sketches, there is no need to be that good with the use of stereo 3D as you can quickly get the hand of it. The DeepSketch application is already available on the App Store for $1.99 USD and it works only on iPads with iOS 5.0 installed, so if you still haven’t upgraded yours to iOS 5 you will have to in order to use this application. DeepSketch uses a slider for easy manual control of the current depth you are going to draw at (left for deeper, right for closer), so you just need to consider if the specific part of the sketch needs to go deep inside the screen or pop-out and respectively adjust the slider, and there is also automatic control of the depth available to help you out (the depth starts from the point where you set it at and moves either closer or farther from you while you draw). You just set the depth of the line using the slider and start drawing, the software automatically draw the two colored lines needed to recreate the feeling of volume, so you can draw wearing a pair of anaglyph 3D glasses or without glasses (if you are a bit more advanced 3D user). The key here is that you need to be able to draw pretty well and I’m not that good with drawing by hand, but still I like the end result, even if it is not the prettiest drawing… it is quite fun to use this application. It supports not only the most widely spread red-cyan anaglyph glasses, but cal also work with red-green, red-blue, magenta-green in this and in the reversed order of the color filters. You can also control the minimum and maximum volume in your drawings, so that you will not get too high separation or too low and make it harder for the people that are supposed to like your 3D drawings. The images you have drawn are saved in lossless PNG format, so that the maximum details are preserved and you can access them from the Photo library on the tablet and of course easily upload or share them with others. Just make sure that you have a compatible pair of anaglyph glasses lying around before getting DeepSketch as the application will not be any fun without the glasses that will allow you to actually see the volume in the drawings. 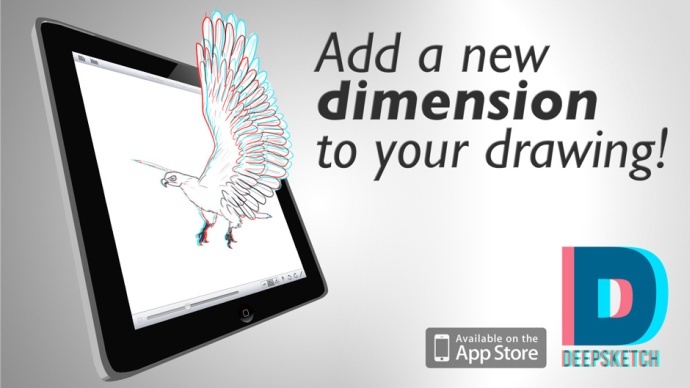 – For more information about the DeepSketch application for iPad tablets…. 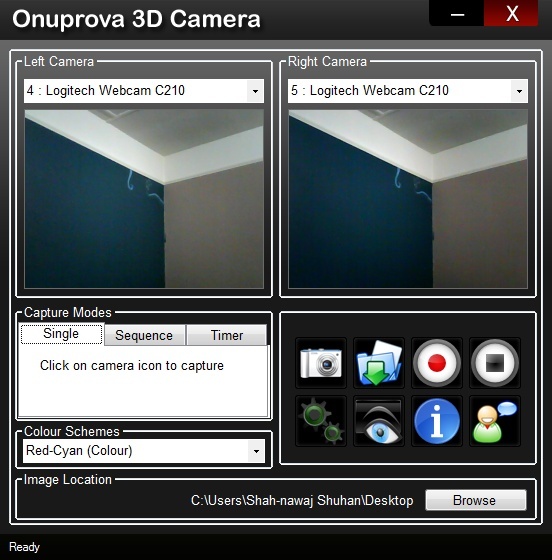 Onuprova 3D Camera is a free software that can help you easily use two web cameras in order to be able to take photos and record videos in stereo 3D, the application can output the resulting footage in anaglyph 3D format using multiple options. The five different anaglyph color schemes supported by the software are: red-cyan, red-green, red-blue, magenta-cyan and green-magenta. And if you don’t have two webcams (preferably the same model) you can also take two photos with a little offset in between with your mobile phone, digital camera or webcam and then import the two images in the software and get anaglyph 3D output. Onuprova 3D Camera is simple and easy to use and you should be able to quickly get the hang of using it, it could take you some more time in order to learn to place the two web cameras with the right distance in between or properly converged in order to give you the best results in 3D, especially if you are new to stereoscopic 3D shooting. Just have in mind that the closer the object you are shooting in 3D the less should be the distance between the two web cameras and the more distant it is the larger the distance should be. As a base you can start with the rule of 1/30, meaning that the distance between the lenses of the cameras should be 1/30 of the distance from the cameras to the object you are shooting in 3D, and this should work quite well as a base to start experimenting with.